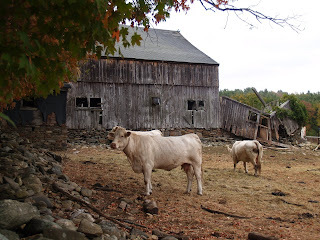 From time to time I'll toss an old photograph of the Sturbridge area on the blog. This photograph was taken sometime around 1906, and made into a postcard. Can you guess where it is? The building is still very much in use today, and is a great example of preserving the past for today. Post your guesses, and after a bit, I'll let on just where it is. About 20 years ago I was working as an RN in Natick, MA at the Leonard Morse Hospital. One of my "distractions" at that time was writing for the then "Middlesex News" newspaper on the Op-Ed page. The hospital asked me to write something in support of the paramedic program they were in the process of establishing. They wanted something written that the residents of the area could relate to, and in turn support the new paramedic program. They came to the right person. In the article I wrote of last seeing my mother on a stretcher being carried down the stairs of our home by the on-call firemen of our town in 1963. I was 9 years old. I also wrote of how a police officer responded to the scene of my sisters drowning in a neighbors pool when I was 16 years old. Each incident was handled the very best way it could have been for the times, but now there was a better way. 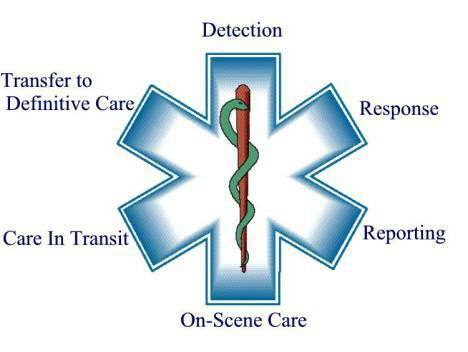 A better system to respond to accidents and sudden illness other than by First Aid trained first responders, and EMT's. A system that employed paramedics. The new paramedic system began in Natick and served the surrounding communities. I like to think my article helped to bring the system into place by relating the just what the new service could do for the people in the area beyond what was currently offered by EMT's. There are just times when the immediate treatment with life saving procedures and drugs are needed, something that only the medics can do. Now, almost 20 years after the implementation of the Paramedic Service in Metrowest, another citizen has come forward and asked for a similar service for this town and surrounding area. Ann Marie Argitis asked the Board of Selectmen this past February to begin staffing Paramedics based on her experience with her husband requiring emergency medical services. Those services were supplied by the town of Brimfield, but Argitis was unaware that there was no Paramedic service available in the area. Her request based upon her own personal experience prompted the Board of Selectmen to bring the idea to the Town Meeting in April. As a result a committee was formed and the actual service went into effect on November 20th. Incredible. Nine months after initially bringing an idea forward to the Board of Selectmen, it was voted on, explored, worked on, and implemented. Nine months. In the world of small town politics, this was done at the speed of light. If anything, this shows something very important. This shows us all that when an idea is well presented by those that are passionate about it, and well received by others in a position to make it happen, it will happen. Take this as a lesson for future changes as well. Become passionate about your ideas, and present them in a way as to make others passionate about them as well. As a result of that idea planted in the minds of the Board of Selectmen last February, all of us are just that much safer, and secure. More lives will be saved as a result of the immediate medical treatment given at the scene and enroute to the hospital. On November 12, 2005 I had a reason to have the Sturbridge 911 called on my behalf. I passed out, and was revived by my now fiance. I had the "worst headache of my life" and nothing I took would make it better. I began to become nauseous, and the discomfort became more unremitting. I knew what it was. My father had died from a cerebral aneurysm when he was 26 years old and I was three. I had expected something like this all my life with every headache I had. Now, I felt, my prophecy was coming true. My fiance called 911, and within just a few minutes the EMT's were in the house. They were smart, professional, and very calming. They knew exactly what to do, and as a result my being revived by Mary, that phone call to 911, and the EMT's caring for me enroute to Harrington Hospital my chances of survival escalated greatly. The care at Harrington Memorial Hospital was excellent, and soon I was flown by helicopter to Mass General in Boston. A little surgery later that evening, two weeks in the hospital and one at home, and I was back at work. Bad haircut and all. I have never had a chance to thank those that responded to my needs that day. I guess I am doing that now. Thank you. I am also thanking the Board of Selectmen of the Town of Sturbridge, the voters at the Town Meeting, and most of all, Ann Marie Argitis for taking emergency care we all expect to a much higher level as of November 20th, 2007. See, things can succeed and move quickly, even in a small town, if we are passionate about them. Find your passion, and follow through. This past September, at a Special Town Meeting, we chose to purchase a large strip of land on the south side of the Quinebaug River for $860,000.00. The land stretches all the way from Stallion Hill Road opposite the parking lot of Old Sturbridge Village to Holland Road. It is a beautiful tract of land, and well worth purchasing, but for what? the land for future generations. Yata yata. But, what about this generation? What excactly are we going to do with it, and how soon? I've heard, and read, that hiking trails would be part of the towns development of the land. Great. Don't get me wrong, I like to hike/walk along the trails we have in the area. I've hit most of them. I really enjoy it, in fact, the more trails we have the happier I am, but we need something more than just trails. We need something that is so awesome that folks will drive to Sturbridge to see and use it. Much like Look Park in Northampton. Paving the trails along the river so that strollers, bicycles and wheelchairs would have safe access is very important. If not paving, then compacted stone dust for now. Paving later. The trails also need to be planned very well to take advantage of the wonderful scenic areas along the river. Whether its bird watching along the wetlands, or looking down on to the river from high on a hill, we need to have areas constructed just for those purposes. Next we need footbridges. At least two. One crossing the river down by the rear of Dunkin' Donuts, and the other further west crossing over the river behind the Marketplace at the Falls. If we are going to attract folks to town, even our own residents, to use the area, then we need to make sure they have access to shops and restaurants in town. The footbridges would grant this access, plus add a certain appeal to the land and river as well. Now that we have good trails, and a couple of footbridges we need to offer the conveniences, and niceties for those using the land. Sanitary facilities are extremely important. Don't even think of building a wonderful recreation spot without considering them. They don't have to be on a sewer line, and they don't even need a septic system per say. There are systems out there just for this purpose that impact the land very little. Facilities are a must. Now, I am not sure about just where the land ends on Holland Road. I am not sure if the land in and around the old mill on Holland Road is included on the purchase. Sorry. I haven't seen a map of the purchase, but what if it did, or what if the town purchased that old mill, then what? I can see a restaurant built along the mill pond just west of the dam. Outdoor tables along a deck looking out over the water. Shops inside the mill, and above all--parking. Lots of parking. We have a good number of craft and antique stores in town, all very nice, and offering fine quality goods, but what about art? What about art galleries? Pottery galleries, galleries for paintings and sculpture. Art attracts a different genre of tourist. And if the galleries are owned by well known artists, or gallery owners they can actually sell themselves. Sounds pretty nice, huh? Close your eyes. Picture it. Nice. But wait, we have a problem. You see a good portion of the land purchased is sitting on a dump. Yep. An old dumping ground is directly across the river behind the Marketplace at the Falls, and it's packed with stuff. Old stuff. Old glass, and stoneware, metal, and stoves, more glass, and more rusted metal, bottles and cans. Trash. One hundred year old trash, and lots of it. this land is going to need a complete remediation. Soil needs to be tested, a plan made for its removal, and another plan made for the lands restoration. Suddenly, $860,000.00 is not that much. I'd like to see what the town has planned. In the meantime, we have saved a pretty piece of land along the river for the next generation to develop. After all the meetings to come regarding this tract, it'll be at least that long before it is ever used. Please have the next generation scatter my ashes along the paved, restored trail. Fiskdale is a village within Sturbridge. From the western shore of Cedar Lake to the Brimfield line, north on Route 148 a couple of miles, and south on Holland Road for a bit, Fiskdale occupies a good portion of the town. Long ago the original Bay Path ran through Fiskdale and on to Springfield. The Quinebaug River flows through the village parallel to Route 20. This river was vital to the region years ago. Its water supplied the needed power to run the textile mills. At one time, the mills in Fiskdale supplied a large portion of the textiles for the new country. Today, one old mill building is located on Route 20 and has been nicely converted into many shops. Behind the old mill is the river and an old mill pond. The river flows from Holland into the mill pond and then over the falls and on into Sturbridge and beyond. The remnants of another, larger old mill is at the corner of Route 20 and Holland Road. Today, the village is having its problems, mostly related to the drop in tourism since 9/11 and before. Restaurants, shops, and motels have either changed hands frequently or have closed up for good. BASKETVILLE, a fixture in the village for 30 plus years, closed its doors for good last spring, and has remained vacant since. The Holiday Inn Express has changed hands twice in the last six months as has the motel on the top of the hill at the corner of Cedar Street and Route 20. It is now a MOTEL 6. The restaurant, BIN 479, the towns only wine bar, closed over the summer, and is currently being resurrected into a sushi bar and grill. I wish them all the luck in the world. The Van Heusen store is currently having "Going out of Bussiness" sales, and the lodges at Old Sturbridge Village have been vacant and for sale for over a year. This is only a fraction of the closures, sales, and store relocations here in the village. Well, we need a make over. Badly. 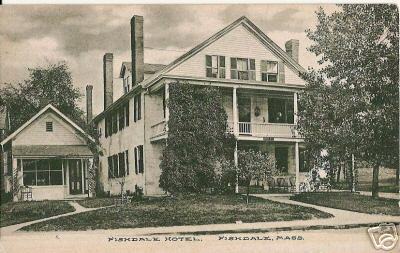 Fiskdale is where most of the antique and craft stores are in the town, and with the exception of the Publick House on the town Common, all of the fine dining is located here as well. It has become "Walking Village", but the infrastructure does not lend itself to that, so, I've been thinking. First, we need to make the Fiskdale stretch of Route 20 more pedestrian friendly. If you have ever been out to the Lee/Lenox area and noticed how they have constructed their sidewalks, crosswalks, and lighting to augment their "Walking Village" you will understand what is needed here. Sidewalks are essential on BOTH sides of Route 20. More crosswalks, too. and make them fancy. Use those machines that cut a brick pattern into the asphalt and paint them a brick color for the crosswalks. Nice. The sidewalks need to be redone, and need to be on both sides of the roadway. Concrete is fine with granite curbs, but leave cut-outs all along the sidewalks for the planting of trees. The street, at one time, was tree lined, but witht he widening of the road, the Hurricane of 1938, and disease, the trees are no longer there. The village needs them. Next, is lighting. We need nice street lights. Not the "on-the-telephone" pole yellow light kind of lights, but nice ones. Look at what Southbridge has done with its down center, and look at the street lamps it installed. Very nice. Black ornate poles with "antique" glass enclosed lights at the top. The little town of Millis, MA did the same a few years back when it redid Route 109. New concrete sidewalks where there had been none, and new street lamps all along the roadway were added. It's a small town, but the look of it has changed dramatically. Finally, we need more siting areas like the one recently built at the corner of Route 20 and Cedar Street. This is a great addition to the area, and the Town and the Rotarians should be strongly commended, but we need more. After all, if we are to attract business from pedestrians walking our streets, we need to make it as comfortable and convenient as possible. This is a start. If the Town of Sturbridge is serious about reversing the trends, it needs to invest some dollars to facilitate those changes. It will pay off. When business sees the town taking an active role to attract both business and tourists, more will come of both. In my next post I will ramble on about the newly purchased land on the south side of the Quinebaug River by the Town of Sturbridge. Extraordinary foresight, or monstrous boondoggle? In the meantime, I'll be thinking. Note: Photo of cows was taken on Douty Road, Fiskdale. Sturbridge may be referred to as the "Crossroads of New England" because of its location with the junction of Route 20, Route 84 and the Mass Pike, but the town itself is actually at a totally different crossroads. Seems everyone is asking, "Where do we go from here?". For the past half a century the town has done quite well. We have kept ourselves small in population, but simultaneously served a large tourist population. Old Sturbridge Village, the re-created 1830's New England village, has done a wonderful job of luring generations of school children, their parents, and others to their gates. Those tourists walked the OSV grounds, and painlessly learned a great deal about old New England life. They stayed in motels around town, and spent their dollars at any one of a dozen or so antique and craft shops. They camped at one of the camp grounds in town, or rented a cottage on one of our lakes. We were doing fine. Traveling changed. The tourists numbers dropped, not just here, but nation wide. Tourism had already begun to slow prior to 9/11, but that date changed the market place forever. OSV took a financial hit. The area shops felt the drop as well, and many have closed up shop for good. Now, OSV is recovering thanks good planning, strong leadership, money from the Commonwealth and selling off some of their unused land to the Town of Sturbridge. New life has been breathed into the Village, and they are learning to vie for a new type of tourist. This new tourist still wants what OSV has to offer, the crafts and antiques at local shops, and the fun on our lakes, but they want more. Problem is what they want is something we don't have -- yet. Sturbridge has done a great job securing land in recent years for development in passive tourist attractions such as hiking paths, canoing, and horse back riding trails. Trouble is they are still in the planning stages. Nothing is ready, not even a firm plan. Todays day tripper wants to take the family out and away from home to see things they don't see at home. Makes sense, right? Well, OSV does fit the bill, but what else can you do besides shop, and eat at one of the many restaurants in town? Not much. Well, I have a plan. Once you read what I am thinking I want you to close your eyes and envision it. Feel free to tweak it. But, after you envision it, and if you like it, then don't offer a comment to me, instead, use the time instead to write the editor of one of our local newspapers, write to the Town Manager, and the Board of Selectmen. Talk it up at Holiday gatherings, and at the store. In other words, pass it on. The more it is discussed, and tweaked at the level of the resident, the more it will be anticipated. The more excitement will be generated. And, faster things will get accomplished. First of all, the land the town purchased from OSV this year should be multi-use. We need to go in and map out the site (already done), and decide just what we want these 800 acres to be for (partly done). We need to keep in mind that we are not only preserving an wonderful place, but making it useful for those of us living in town, and above all, attractive to those out of town! We can't just hack a few trails in the overgrowth and call a Preserve. Conservation land, preserves and open space are wonderful, but this must bring in people, and those people must bring their wallets. What can we offer? Well, walking trails are a start. Good ones, not rocky paths through the woods. The kind of trails that are flat, paved or compacted with stone dust and are easy to ride a bicycle on, push a stroller, or crank a wheelchair on. They have to be of different lengths, too. We'll need good parking as well. No trail head type of parking. Real parking. There are two bodies of water in these 800 acres. We need to use them as well. Imagine renting a canoe on a summers evening, or fishing in the early morning. Which leads me to the next thing it needs: coffee. More specifically, food. We need to build a restaurant , not too big, but one with a large covered porch to sit on in the morning and have a cup of coffee, or grab a sandwich after a long hike. Places with food always attract more people than places without it. Lease it out, and let it pay for itself. Horses. Ever think of how many horses there are in Central Massachusetts? A bunch. That's an accurate estimate, too. Most live on farms, and at private homes, but what about those that don't have the land for a horse? They can always board them at a farm, but what if the Town built a stable on the 800 acres just for those that want board their horses, and ride the trails? . It's win-win, and whats more, the town is attracting a whole new group of people to the 800 acres, and to the town, and to the shops, restaurants, and stores. And, if you have horses, you can have carriage rides along the trails, and sleigh rides in the winter. And speaking of winter, what about cross country skiing, and skating? Suddenly, our 800 acre piece of heaven has become year round. Tomorrow, I'll tell you what I've been thinking about Fiskdale.